Premier League side Liverpool will aim to get back to the table top when they take to the field against Bournemouth on Saturday. Premier League side Liverpool will aim to get back to the table top when they take to the field against Bournemouth on Saturday. The Reds have been in stellar form this season but consecutive draws against Leicester City and West Ham United have put them in a tricky situation against Manchester City. 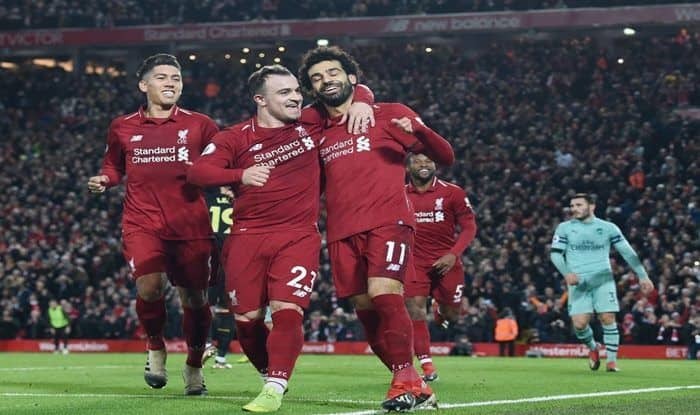 However, the title race which is turning out to be a two-horse race between Liverpool and Manchester City is still in favour of the former as they have a game in hand and could go three points clear with a victory. Manchester City were at the end of some shocking defeats, most recently, against Newcastle United and the Jurgen Klopp side has benefited from that. Liverpool are also banking on the form of the high-flying Mohammed Salah. In the table, the Kops are placed on second with 62 points, whereas Bournemouth are in the tenth position. On paper, Liverpool are clear favourites but Bournemouth will look to bring their A-game on to get a result in their favour from this anticipated fixture. When and what time is the Liverpool vs Bournemouth match in English Premier League 2018-19? The match will begin at 8:30 PM IST on February 9. Where will the Liverpool vs Bournemouth match take place? The match will take place at Anfield Stadium, Liverpool. Which channel will telecast the Liverpool vs Bournemouth match? The match will be telecasted on Star Sports Select 1/Star Sports Select 1HD. How to watch live streaming of Liverpool vs Bournemouth match?